I spent the day fishing a little feeder stream with my client Thao Le. We began our day around 10 am ET, sky was cloudy, water was ultra clear and on the low side with air temperatures of 48 deg for a low and 62 deg for a high. With the water being low and clear I opted for a dry fly dropper rig for Thao to start with. There are a lot of caddis in this water system so I tied on a size 18 Tan Caddis dry fly and a size 18 standard Pheasant tail nymph for the dropper fly. We started fishing a beautiful run that had an overhanging evergreen tree limb hanging over it. It wasn't long before a gorgeous Central Pa Wild Brown Trout snatched Thao's dry fly at the head of the run. After a few quick pics the fish was released and we were back to fishing. Minutes later Thao was hooked up again View more...I spent the day fishing a little feeder stream with my client Thao Le. We began our day around 10 am ET, sky was cloudy, water was ultra clear and on the low side with air temperatures of 48 deg for a low and 62 deg for a high. We started fishing a beautiful run that had an overhanging evergreen tree limb hanging over it. It wasn't long before a gorgeous Central Pa Wild Brown Trout snatched Thao's dry fly at the head of the run. After a few quick pics the fish was released and we were back to fishing. Minutes later Thao was hooked up again but this time a large Rainbow Trout took her Nymph and the fight was on. Unfortunately the large fish had other plans and he threw the fly before we could net him. We continued to fish but the run turned cold so we headed upstream to another spot. As we slowly approached the next run I noticed a large Rainbow Trout suspended about a foot below the surface of this deep pool. I instructed Thao to cast upstream of this fish and she placed a perfect cast 2 feet in front of his nose. The fish instantly attacked her Pheasant Tail Nymph and Thao was hooked up to a true "Monster Trout". The fish upon feeling the hook set bolted directly for a tree root on the opposite stream bank. Thao, being an experienced angler, kept him from advancing and the fish changed plans and headed downstream. Thao followed and the fish switched gears and took off back upstream and feeling the pressure of her line he jumped a foot out of the water.This was a fight for the ages and my adrenaline was pumping just watching it. After several minutes of this tug of war I was confident that Thao had weathered the best that this fish could offer but I was wrong and in one last hard run he somehow threw her fly! To say we were both heartbroken would be an huge understatement. After a consolation hug Thao was back to fishing. We didn't have any luck for a while so I changed her flies. I tied on a pink "squirmy wormy" and on her first drift a fat Wild Brown attacked and Thao was back in the fight. Unlike her last encounter this fish was subdued quickly and we snapped some pics and released the fish to fight another day. 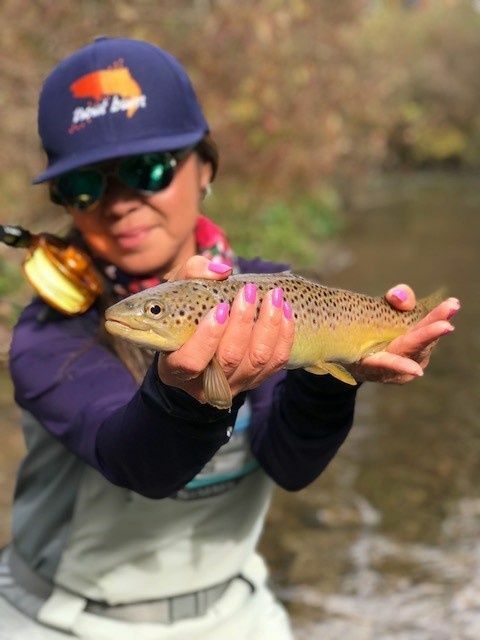 Thao continued to fish hard throughout the day and she was rewarded with more Wild Brown Trout but the thought of losing that trophy Rainbow never left either of our minds. I have a sneaky suspicion Thao will be coming back to catch that Rainbow some time soon..